1. Get prepped: Prepare a medium hot charcoal or gas fire. 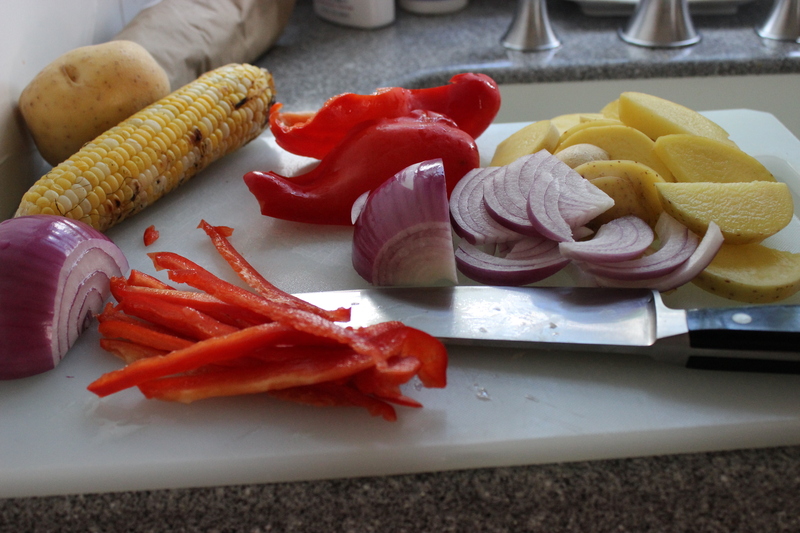 Meanwhile, thinly slice 1 red bell pepper (about 10 oz.) and 1 large red onion (about 1/2 lb.). Cut 2 large Yukon Gold potatoes (about 1 lb.) into 1/4-inch thick half moons. Remove the kernels of 2 ears corn from the cob (you should get about 1 1/4 cups kernels). Peel and devein 3/4 lb. 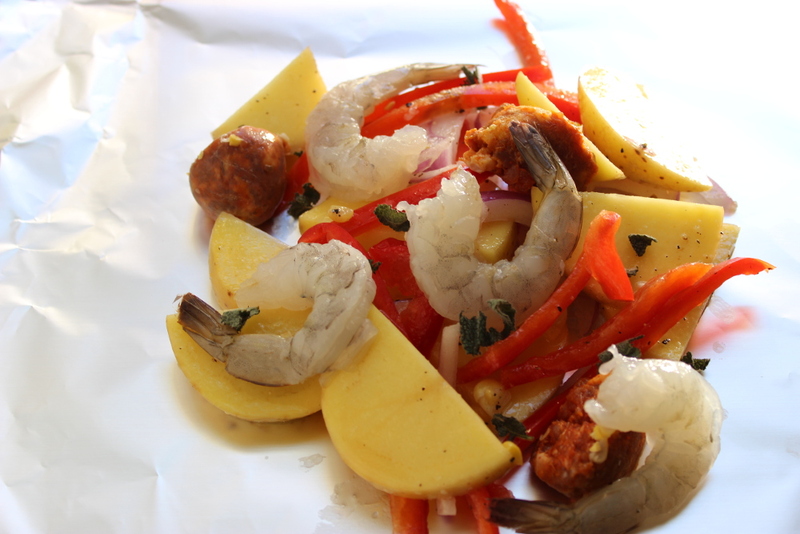 shrimp (preferably 21-15 ct) and cut 2 links Italian sausage (about 3/4 lb) into 1-inch pieces. 2. 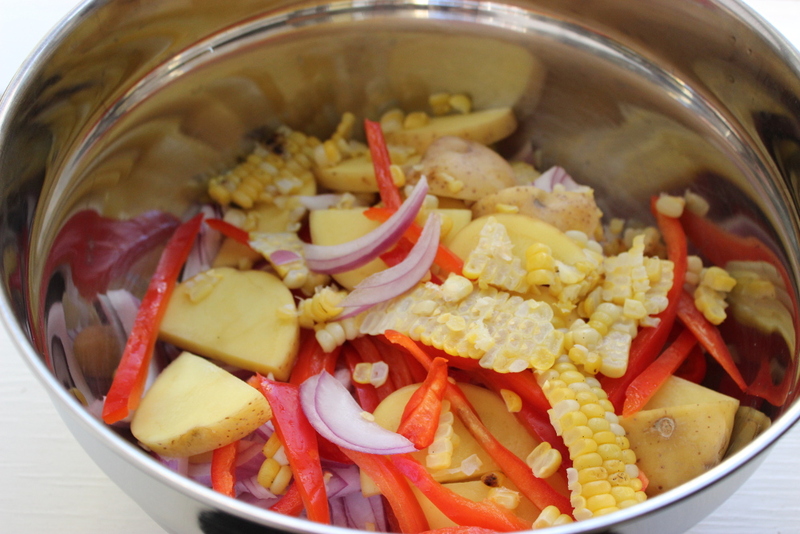 Assemble the packs: Transfer the vegetables to a large bowl and toss with 2 Tbs. olive oil, 2 Tbs. chopped fresh sage, 1 1/2 tsp. salt, and 1/2 tsp., black pepper. 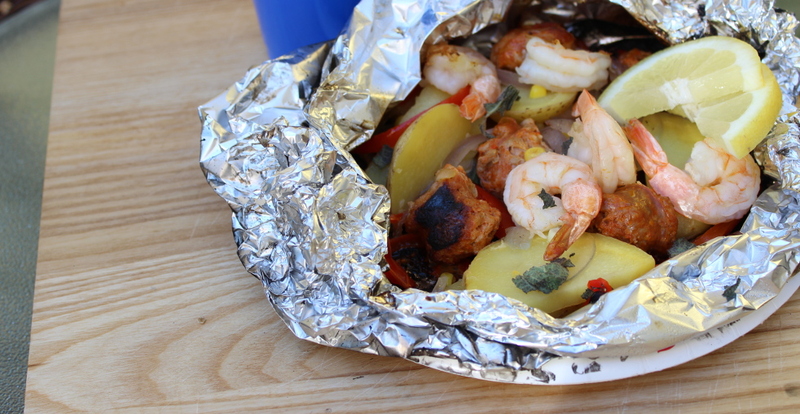 Set a large piece of aluminum foil (about 10″ x 10″) on a clean work surface. Lightly grease the foil with olive oil, then top with about 1/4 of the vegetables. Drop about 1/4 each of the shrimp and sausage on top, drizzle with a bit more olive oil (about 1 tsp. 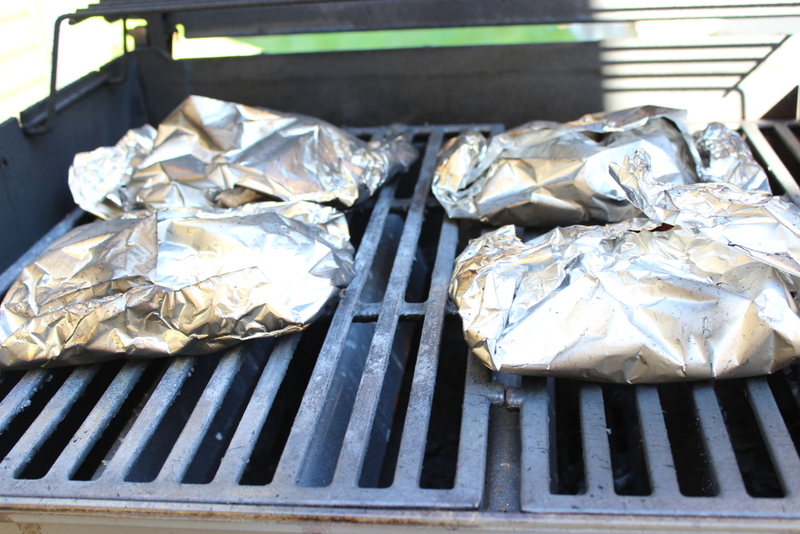 ), and then bundle: fold the long ends of the foil over each other, then roll sides so they form squared-off packets. Repeat with the remaining vegetables and shrimp and sausage. 3. Grill the packs: Set the packs on the grill grates, close the grill (with the vents open on a charcoal fire), and grill, checking occasionally to rotate the packs and make sure they are not burning, until the potatoes are completely tender (test a thicker piece) and the sausage is cooked through, 15 to 20 minutes. 4. Serve: Distribute the foil packs onto paper plates (it’s easiest to eat directly out of the pack; some potatoes may stick to the foil). Serve with lemon wedges for squeezing and hot sauce.